Philip Roth grew up in Newark, New Jersey, the second child of first-generation American parents. His first published novel, Goodbye, Columbus (1959), depicted Jewish life in postwar America. It won the National Book Award in 1960. 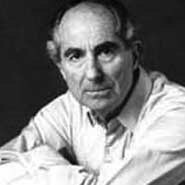 Roth first enjoyed widespread commercial and critical success with his novel Portnoy's Complaint (1969), a comic and self-conscious literary portrayal of a possessive Jewish mother and her guilt-ridden son. Roth is widely considered one of the best American fiction writers, twice winning the National Book Critics Circle Award and winning the PEN/Faulkner Award three times. He also received a Pulitzer Prize for his 1997 novel, American Pastoral.